The City of London, as we mentioned in yesterday’s article, is a strange and fascinating place. So much has happened over two-thousand years! 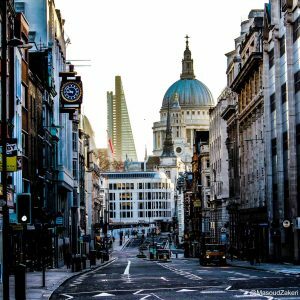 Today, take this guide with you (maybe on your handy phone, if you’re already staying with us), and explore that history made physical with our architecture walk of the area. 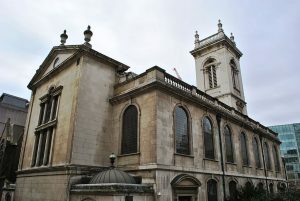 This gorgeous 1687 church in the middle of Holborn is one of the finest examples of Christopher Wren’s work. –Look for the adorable statues flanking either side of the front entrance—they were traditional 17th Century markers of charity hospitals. This imposing Gothic terracotta structure, completed in 1878, is one of the largest and most eye-catching on the whole street. When it was owned originally by the Prudential Assurance Company, the complex included a chapel, a library, a separate women’s entrance and—a real novelty for the time—running water and electricity. As the main library of King’s College, this neo-Gothic 19th Century building might not be as old as it appears, but that makes it no less stunning. Coming down Fetter Lane will give you an idea of the scope of this building. This townhouse, built in the late 17th C, was the primary residence of the writer-thinker-dictionary designer. It’s now a museum. Go inside to see collections on his life as well as Georgian living reimagined. Fleet Street was the centre of the London publishing industry for almost two hundred years. Being one of the vital roads connecting “the two Londons” (Westminster and the City) made it a major thoroughfare of carts and people. This buzz of activity and influence made it the centre of the “news frenzy” in the mid 18th Century. The 19th saw the development of the first worldwide newspapers such as the Times, Evening Standard, and the Telegraph. –Not to mention the old Telegraph, Daily Express, and Reuters buildings. And keep an eye out for the Glasgow Herald’s art deco exterior—it’s the most beautiful of the lot. –Look for St. Dunstan-in-the-West church’s amazing four-hundred year old clock depicting two giants striking bells. Thanks to their whimsical appearance, they’ve been referenced in countless novels. –The alley you entered through is one of the few that survived the fire. Watch for its leaning walls to get that Medieval feel. 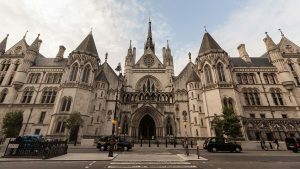 This building, housing the High Court and the Court of Appeal, is one of the largest courts in Europe. Completed in 1882, it was designed in Neo-Gothic style by George Street after winning a national design contest hosted by Victoria. –They often run free tours! Lincoln’s Inn, even larger than Middle Temple, is a gorgeous and sprawling Jacobean hall. Though typically closed to visitors, the park here is one of the loveliest in central London. –If you look on the map, you’ll see that both law societies exist right outside the old city walls. Following a royal law from 1234, legal societies weren’t allowed to exist within the city—hence their placement just past the city gates. –Make sure to pop in to Sir John Soane’s Museum at the north side of the park. As one of the most respected neo-classical architects in the 19th Century, this free museum of his former home is a disorienting, illuminating trip into the architect’s mind. Look for the priceless rows of classical and Egyptian antiques, as well as the incredible paintings by William Hogarth in the picture room. Don’t miss this! 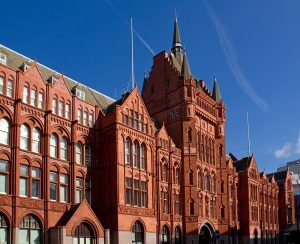 Finish off this architecture walk at one of the most striking buildings nestled on Holborn. Having survived the 1666 fire, this building, belonging to a minor legal society, is very evocative. 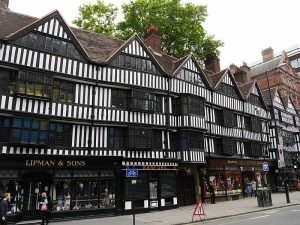 Look at its timber walls, observe the way its upper columns lean out towards the street, and imagine what the Elizabethan era was really like. That’s a fair trot! Luckily at this point, the Chronicle is just around the corner—it’s the perfect time to rest and relax after a full afternoon of historical adventuring.